One of the things I’ve learned through my reading of Scripture and my experience of the Christian life, is that spiritual growth is not so much about restraining old (sinful) desires but about gaining new, godly desires. But in order for this to happen, our desires must be changed and this is the root of the Christian concept of repentance. Repentance is not merely a conscious turning away from the world towards God, but on a deeper level it is exchanging old desires for new ones. The new desires are not sinful but Godly, and they are to be enjoyed. So the Christian life is not so much about restraining desire, as it is about indulging desire (the right desires!). But how do we understand this? And more importantly, how do we go about doing it? Dante Alighieri’s Inferno contains a treasure of Augustinian theology wrapped in stunning verse after stunning verse. It also has much to say on the nature of sin, deisre, and repentance. 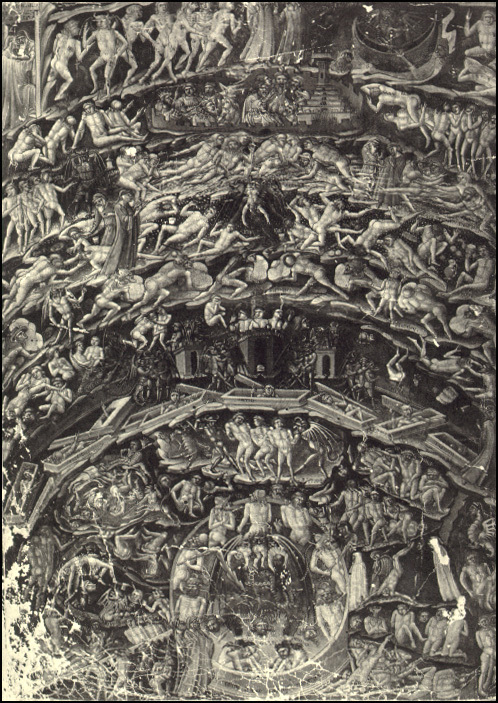 So we will turn to his most famous work, The Divine Comedy, but particularly to the inferno to help us understand the complex interplay of sin, repentance and desire. What is important to notice about Dante’s theology of repentance is how closely it is tied to his theology of desire. First let us notice what repentance is not. The essence of repentance for Dante is that the human will is turned towards God and away from all things that are not God, or “no God” as Barth would say. The repentance described above is a turning away from sin to gain forgiveness, or to avoid punishment, but it is not a turning towards God for God’s sake. It is a turning towards God for something else. The point being, at the end of the day, our monk still does not desire or will after God. If fear of punishment were removed, he would still sin because that is his desire. This excludes any possibility of repentance. Every law was given to hinder sins. Does this mean when the Law restrains sins, it justifies? Not at all. When I refrain from killing or from committing adultery or from stealing, or when I abstain from other sins, I do not do this voluntarily or from the love of virtue but because I am afraid of the sword and of the executioner. This prevents me, as the ropes or the chains prevent a lion or a bear from ravaging something that comes along. Therefore restraining from sin is not a sin of righteousness, but rather an indication of unrighteousness…This restraint makes it abundantly clear that those who have need of it- as does everyone outside of Christ- are not righteous but unrighteous and insane, whom it is necessary to tame with the rope and with prison to keep from sinning. Do not think that thou are drawn against thy will. The mind is drawn also by love… “Delight thyself in the Lord, and He shall give thee the desires of thy heart” (Psalm37.4). There is a pleasure of the heart to which that bread of heaven is sweet. Moreover, if it was right in the poet to say, “Every man is drawn by his own pleasure,” –not necessity, but pleasure, not obligation, but delight, -how much more boldly ought we to say that man is drawn to Christ?…Give me a man that loves, and he feels what I say. Give me one that longs, one that hungers, one that is travelling in this wilderness, and thirsting and panting after the fountain of his eternal home; give such and he knows what I say. The important thing to highlight about Augustine, especially in terms of repentance, is that God replaces our desire for worldly things by luring us away from them by showing us Himself, which is infinitely more lovely, infinitely more valuable, and infinitely sweeter than all our other lusts and desires. This is the Christian’s experience of Rom 2.4, “it is God’s kindness that leads us to repentance.” When God shows us his kindness, it is an irresistible beauty that compels us to repentance. For Luther especially, this kindness is demonstrated most clearly on the cross, and nowhere is it more beautiful, or more alluring, than the savior who suffers for the ungodly. When God draws men and women to himself, by showing himself to them, they begin to desire him. So they repent. Their repentance is both voluntary and genuine. Rather than sinning freely and repenting grudgingly, they not repent freely and sin grudgingly. So it can be said that their will has changed, their desire has changed, and their heart has changed. May God draw you and I daily by the beauty of the crucified Savior, away from the things of this world that we might desire him, and have our desire!